A subcommittee of the Oregon Lyme Leaders (the Oregon Lyme Leaders Task Force) has been working toward draft legislation, drawing on months of collaboration and, for some or all members, years of preparation. The task force has used data from studies and surveys which were spearheaded by Oregon Lyme Disease Network over the last ten years. This data has been specific to state-related issues including cost studies, studies of endemicity, relationship studies of Autism and Lyme, and more. Provided below is the announcement posted yesterday by long-time organizer and task force Leader Theresa Denham and task force members Dr Steven Heppe, Deb Elder (DiveGirl Deb on Facebook)–Lyme Disease Eugene Oregon (LDEO) founder, and Katie McLaughlin MSPT. While it is not yet time to contact representatives, there are specific requests the task force is making via their announcement to support their efforts so far. Multiple prior articles on this blog reference the work of the group Lyme Disease Eugene Oregon, founded by Deb Elder, including a movement for a Lyme Awareness Stamp and their collaborative networking with Washington activists (making promising progress toward their proposed Chronic Lyme Bill, SB 5448). 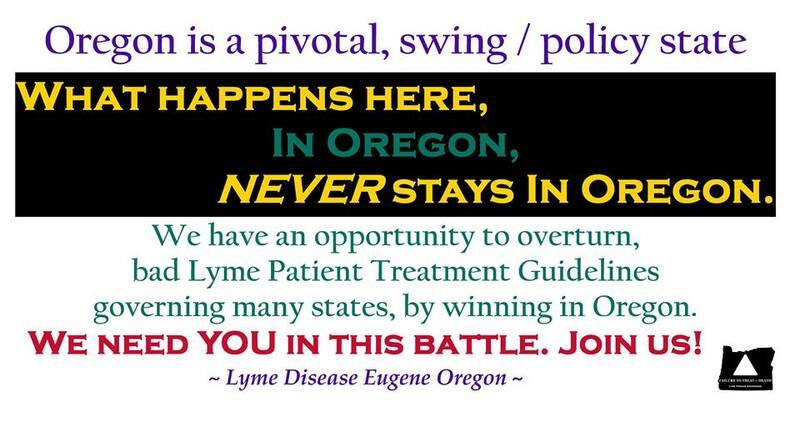 Oregon Lyme Disease Network, founded by Theresa Denham in 2004, is a 5013C that has spearheaded awareness, advocacy and supporting support groups in Oregon. The group’s research and data collection efforts have not been covered here to date, but will be in the future, as their approach and their findings are noteworthy, to say the least. We are ecstatic to announce progress on behalf of Oregon Lyme patients. A subcommittee of the Oregon Lyme Leaders has worked diligently for months to introduce a legislative bill. Attached to this letter you will find a first draft of the bill which we have introduced into the Oregon 2015 Legislative session under the direction and approval of Senator Tim Knopp and Senator Laura Monnes Anderson. The bill being introduced allows physicians (MD’s) and nurses (NP’s) to diagnose and treat Lyme disease and associated illnesses per International Lyme and Associated Diseases Society (ILADS) guidelines without censure. “The act within this 2015 bill is necessary for immediate preservation of the public peace, health, and safety and an emergency is declared to exist”. Since it is an emergency bill, we can expect the possibility of an expedited process. Therefore, everyone involved and all supporters of the bill need to be ready to respond quickly. • Share this draft with your friends, family and physicians. We may need your help in the future with letter writing, calling, etc. But, right now we need physicians and nurse practioner to tell their story to justify the bill passage. If passed, the new law will protect their license . Directs Oregon Medical Board and Oregon State Board of Nursing toadopt rules regarding diagnosis and treatment of Lyme disease.Declares emergency, effective on passage. A BILL FOR AN ACT Relating to Lyme disease; and declaring an emergency. SECTION 1. (1) The Oregon Medical Board and the Oregon State Board of Nursing shall each adopt rules regarding the diagnosis and treatment of Lyme disease. (2) The rules adopted under this section must:(a) Permit professionals regulated by the boards to diagnose and treat, in manners consistent with the standards of care guidelines developed by the International Lyme and Associated Diseases Society,Lyme disease and associated viral, bacterial and parasitic diseases; and(b) Establish disciplinary procedures that consider as a mitigating factor whether, in diagnosing or treating Lyme disease or associated diseases, a professional who is facing discipline followed evidence based diagnosis and treatment guidelines not recognized by the boards. SECTION 2. The Oregon Medical Board and the Oregon State Board of Nursing shall adopt rules under section 1 of this 2015 Act not later than January 1, 2016.SECTION 3. This 2015 Act being necessary for the immediate preservation of the public peace, health and safety, an emergency is declared to exist, and this 2015 Act takes effect on its passage. The announcement speaks for itself, but it is worth reiterating that the group is asking that people share the draft and that if patients feel the circumstances described above apply to them to have MD’s and GNP’s contact Theresa Denham. I have corresponded with Theresa Denham, who stressed that confidentiality is ensured. An additional important note from organizers, in response to questions from supporters, is that it is not time yet for calls to representatives, but as noted in the announcement, to be ready for the next steps as announced/requested (which may be short notice). In my own words, be ready to jump to help, but wait for the task force to request specific assistance and provide instructions. Timing can be everything, so make sure you are in stride with the organizers on this or any legislative efforts. You can watch for progress and show support by joining thousands of other patients on the Lyme Disease Eugene Oregon group on Facebook. Organizers in other states interested in assistance with data collection may be able to procure help from Theresa Denham for a small fee, and can stay tuned for future articles on the research and data collection efforts of the Oregon Lyme Disease Network. I am excited for Oregon patients, to say the least, and am personally intrigued by many aspects of this group’s progress and the support from the Senate it is receiving. I am particularly encouraged by the highly appropriate urgent tone of the draft and the possibility of an expedited process. I am not well versed in the steps of proposing legislation, but I feel it is worth watching and learning for all patients in all states that do not currently have adequate mechanisms for protecting access to care (which is most states at this time). Oregon also may have additional political importance based on past patterns seen in the past (see image below from Deb Elders for some examples). The fact that this is an emergency bill seems incredibly encouraging and I am excited to learn more about what this means as the group’s progress continues. As a patient, I feel supported by the language included, so it seems very positive. Which is why I further encourage patients in other states to watch the progress of this bill, in addition to the announcement’s having noted the possibility of short-notice assistance being needed in the future. In addition to my political interest in the success of this bill as a Lyme Disease patient, I am also just plain proud of what the group has accomplished so far. I have met Deb Elder in person and greatly enjoy the enthusiasm and fortitude she uses to rally those around her. I’ve spoken with her since the announcement as well, and know she is extremely excited by the support they’ve received. Thank you Angela for your supportive & articulate article. We are all in this together. The Oregon Lyme Leadership & Task Force here is comprised of some of the smartest, kindest and most passionate folks I’ve ever met. I’m immensely proud of our work thus far. This is a tremendous task (all while sick too) but an essential one. Thursday when we got the draft back (see below) I was in tears. The emotional waves of knowledge that I might finally get care broke loose. We’ve a long road to get this enacted but it’s a huge step forward. Stay tuned! Now, together, we are poised to aid hundreds of thousands of critically sick patients. . .that gives me goosebumps.